This weeks “Loving Island Life” Blog focuses on one of the more popular questions I get when clients are considering a move to Bainbridge Island. “What’s the ferry commute like from Bainbridge to Seattle”? Well, the answer to that question is it depends on where you live, and where you work. I can tell you that the ferry is extraordinarily reliable, and a very relaxing disconnect from our busy world. The dock to dock time is 35 minutes. What happens on either end of that will determine your total commute time. Most likely it will be 1hr to 1+30 min. The ferry leaves every 55 minutes from 4:45am until late in the evening. Here’s a few things that you will need to keep in mind. Bus Routes-Kitsap Transit has an excellent bus system that is centered around the ferry schedule. The bus will pick you up close to your neighborhood, and in some cases right in front of your house. A monthly bus pass from Kitsap Transit is $50. Company Shuttles-Some companies have a shuttle service from the Seattle side to their offices downtown. Be sure to check with your company to see if this service is available. Walking on and off the Ferry-This is the easiest commute. Most of downtown is easily walkable, and monthly passes are reasonable. Remember you only pay from Seattle to Bainbridge. Bainbridge to Seattle is free. Monthly walk on passes are about $100. Parking on the Bainbridge side-The cost to park your car on the Bainbridge side is about $10 per day. Monthly passes are available and are discounted. Parking a car on the Seattle side-Parking garages on the Seattle side are available from $200 per month. Vehicle Charge-$13:65 No charge for passengers from Bainbridge. From Seattle there is passenger charges of $8. Discounted cards available. Subject to change seasonally. Biking on and off the ferry-A bike pass is $20 per year in addition to your walk on pass. Motorcycles and Scooters-The cost is $7.65 per trip. Discounted passes are available. After hours on Bainbridge-Viking Cab Company is available until the last ferry of the evening. They usually have cabs that head north, south, east, and west. You may have to share, but it’s fun to get to know your neighbors and visit. They will drop you off in a geographic order. Be sure to call ahead for reservations. Commuting to Seatac-My husband does this once a month and prefers to use a town car service. They are the same rate as taxis, but are always prompt and efficient. The going rate is about $40. The light rail is also just a short walk from the ferry and is about $6. Carpooling-This is done extensively, and especially with kids sports events, etc. Local networking is not a problem. 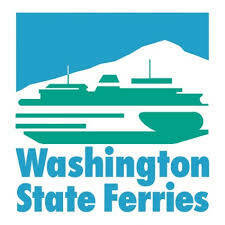 For Detailed Ferry Fare Information-Visit WSDOT Bainbridge Ferry. This should be enough information to get you started. A few important details to consider when weighing your commute, is some of the traffic issues you will be faced with if you chose to live on the eastside (Bellevue Kirkland, Mercer Island etc.). There are extensive construction projects scheduled and started on the east side of Seattle. Tolling of bridges is already occurring and is a growing trend. Time spent behind the wheel of a car on an interstate is not productive time. Time on the ferry can be productive, fun, or just a relaxing disconnect. You get to decide. If you chose to live close to downtown and are raising children, the cost of private schools would be a consideration, and the expense would most likely exceed the cost of a home mortgage on Bainbridge Island. Bainbridge Island has an exceptional school system. I’d like to leave you with this cute story. My husband and I were enjoying a pizza and drinks at the Treehouse Café near our home. The table next to us had about a dozen people who were singing happy birthday. We joined in, and couldn’t help but notice how diverse this group was. We had to ask how they all knew each other. The birthday boy replied that they had all once commuted on the ferry together to and from their various jobs and careers. As time would have it, some had retired, some now worked from home, and some still commuted. They had all grown so close, they met once a month, just to get together and visit like they did when they all commuted together. This story is one more reason why we choose to live in an amazing community like Bainbridge Island and why we are “Loving Island Life.” Call or click today and let’s get you moving!